Texas Fertilizer Plant Explodes; Unknown Number Killed : The Two-Way The explosion was reported around 7:50 p.m. from West Fertilizer plant in West, near Waco, Texas. Local news reports say that people were trapped in a nearby nursing home and in an apartment building. 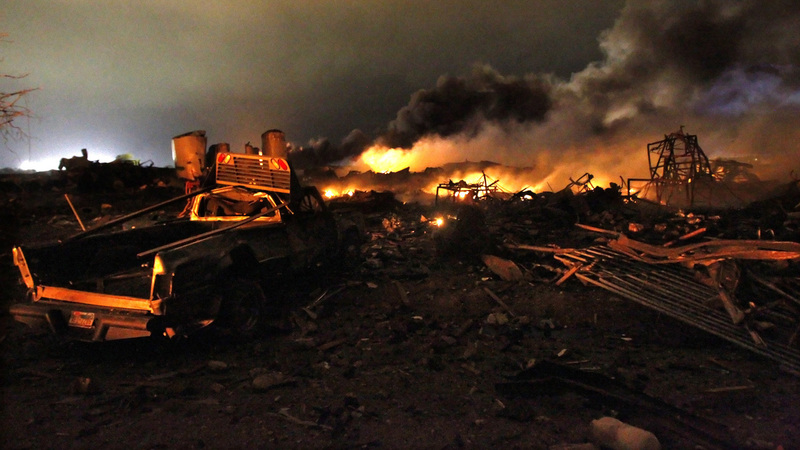 A vehicle is seen near the remains of a fertilizer plant burning after an explosion in West, Texas, near Waco. The explosion ripped through the fertilizer plant late Wednesday. Two-Way coverage of the explosion resumes Thursday morning. For more information, please click on the latest AP report. A spokesman for the Texas Department of Public Safety says an unknown number of people were killed in a massive explosion at a fertilizer plant near Waco Wednesday night. "Numerous injuries were reported and multiple ambulances were requested. "Several buildings were reported destroyed and a nearby nursing home was damaged. "There were reports that people were trapped in the nursing home and in an apartment building." The Waco Tribune-Herald reports that several firefighters were among those injured. The newspaper spoke to Bill Bohannan, who witnessed the explosion. He was visiting his parents at their house in West. "I said, 'This thing is going to blow' ... and I told my mom and dad to get in the car," Bohannan told the paper. "I was standing next to my car with my fiancee, waiting for my parents to come out and (the plant) exploded. It knocked us into the car... Every house within about four blocks is blown apart." CBS Dallas has live video of the blaze. Reporter Becky Fogel of member station KWBU tells our Newscast team that many elderly residents of the nearby nursing home are outside the local community center. They are being put on school buses. She says there are many ambulances and emergency vehicles in the area. "Authorities set up a staging area on the local high school's football field, which was lit up with floodlights. Ambulances and several dozen injured people could be seen being taken away or seated in wheelchairs as they are treated and await transport.